One of the things I love about denim jeans is the colour. I love the different shades of indigo it comes in and the way it fades as it wears. 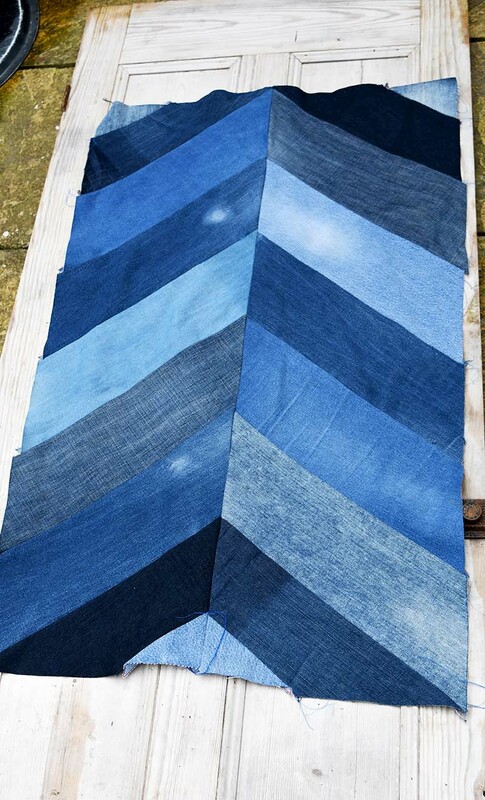 I thought a handmade chevron rug made up of different pairs of old jeans would be a great way to show the various indigo shades. 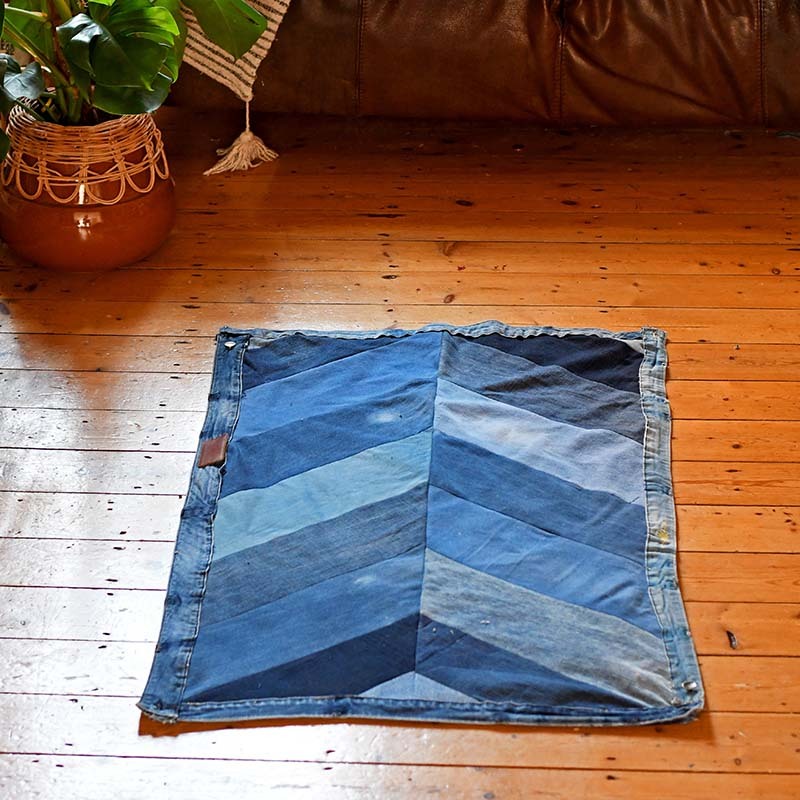 In the past, I’ve made a denim rug out of the waistbands of old jeans. 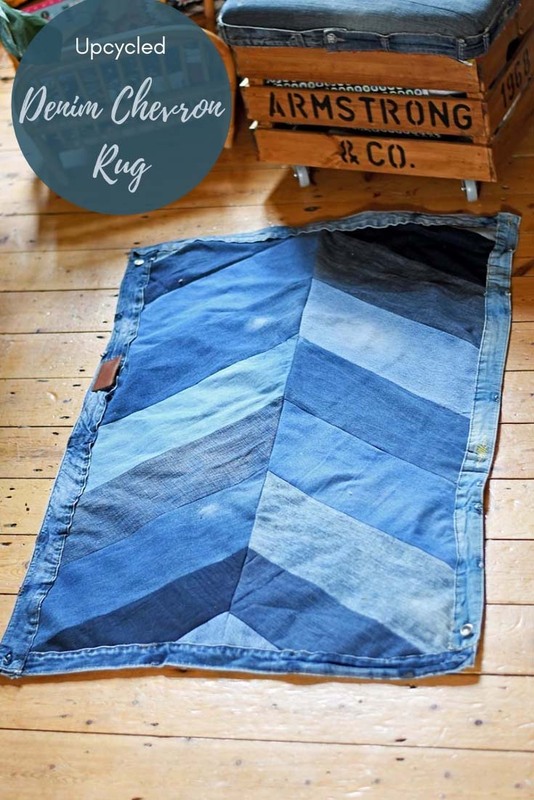 This chevron rug uses the legs of old jeans. However, I still used a few waistbands to edge the chevron rug. The way I have designed this handmade chevron rug, you can make it any size you want. 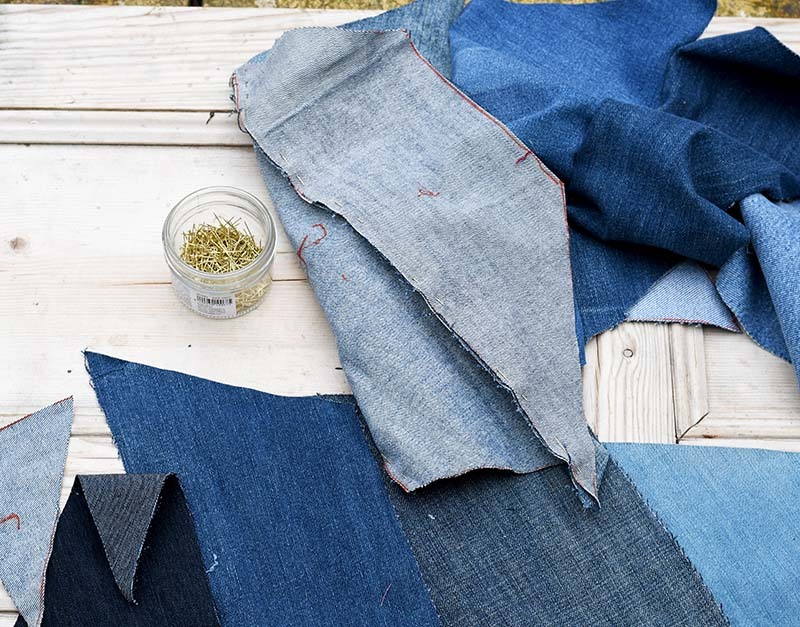 The only thing restricting you will be the amount of denim you have in your stash to upcycle. You can make the rug longer by adding more chevrons to each row and wider by adding another column or two of chevrons. 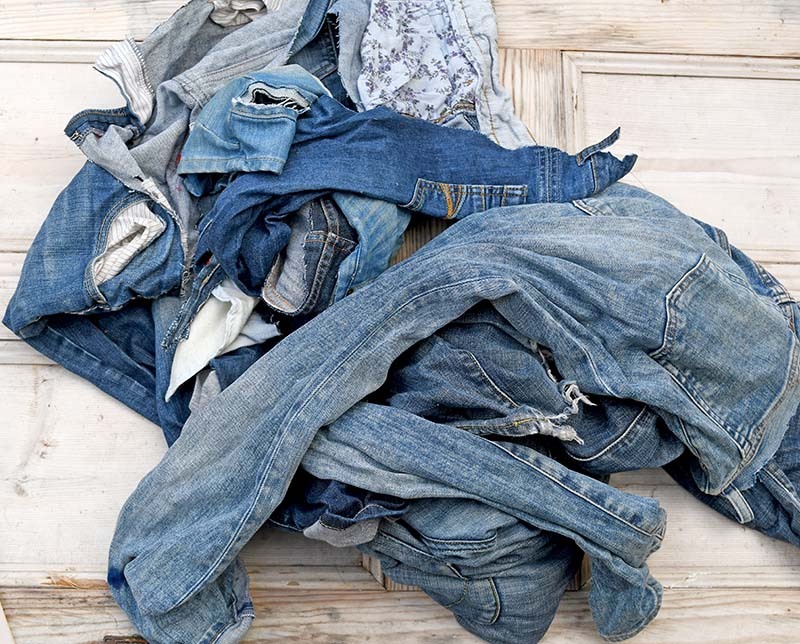 Lucky for me with a family of 3 jeans wearing boys I have a regular supply of denim to repurpose. Cardboard to make a template with. 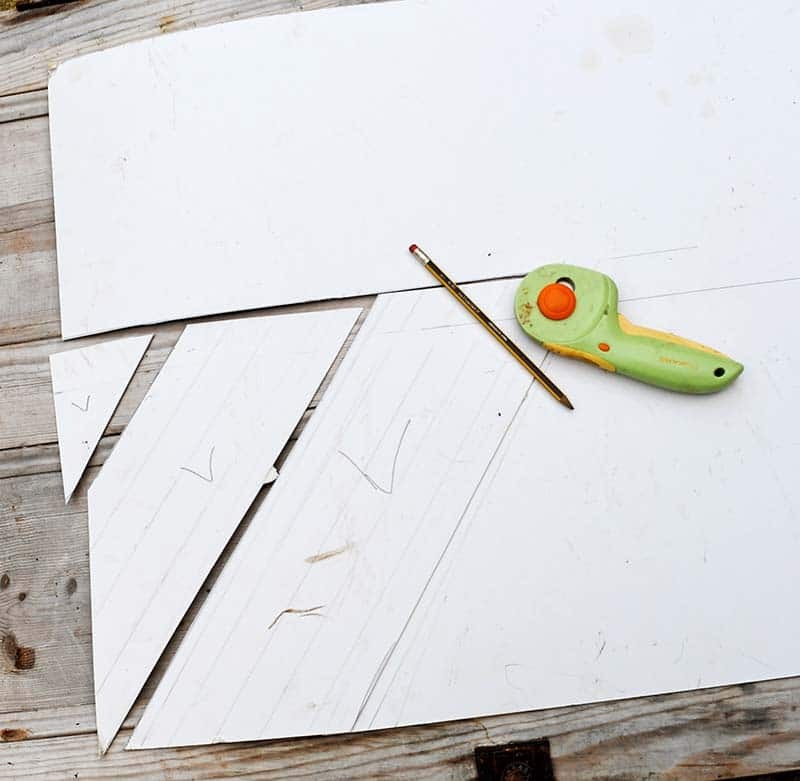 1.Make a template for the rug. Using a large piece of cardboard workout how large you would like each chevron. Make sure you allow for a seam. It is easier to work out the measurements if you draw out the design first. As well as the main chevron piece you will need 2 smaller shapes to finish off the rug at both ends. The picture shows how this may look. You can make the chevrons any size you like and any angle you prefer. 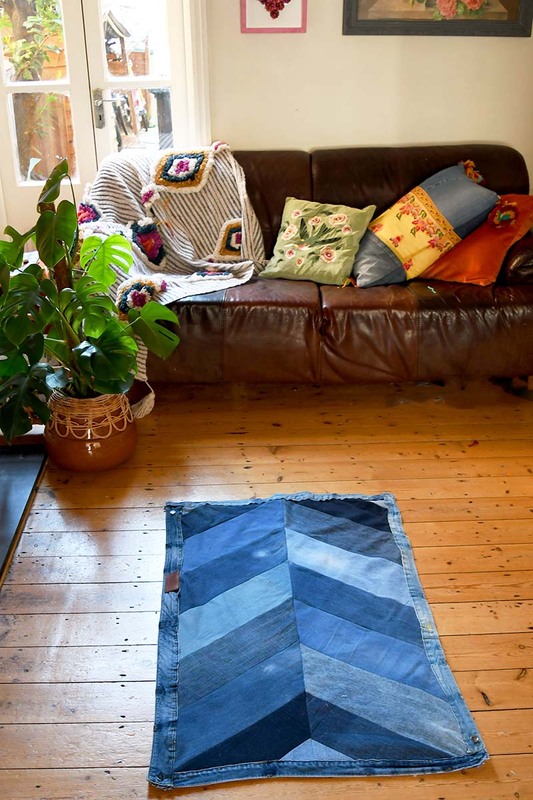 To give you an idea of size the main chevron pieces in the rug were 52cm long and 15cm wide. You will only need to make a template for one side of the handmade rug. Because if you flip over the left cardboard template you will have a template for the right side. I marked each of the three cardboard templates L for left on one side and R for right on the other. 2. 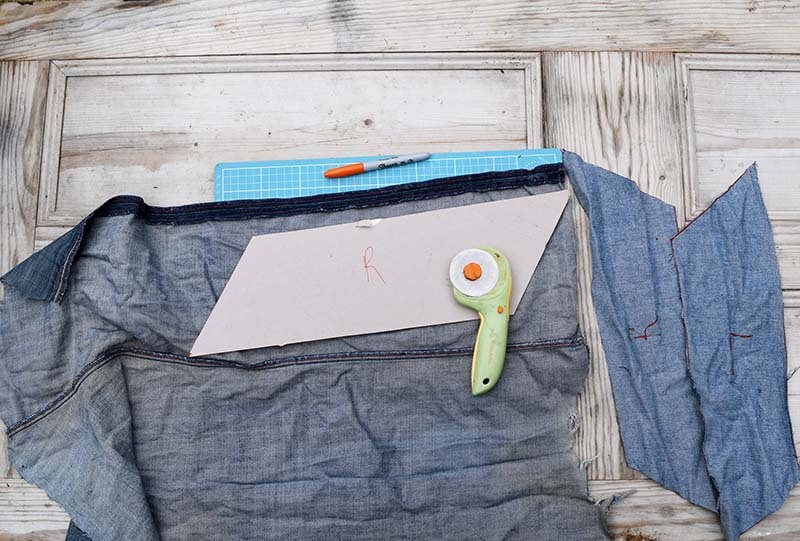 Use the cardboard templates to cut out the denim pieces. 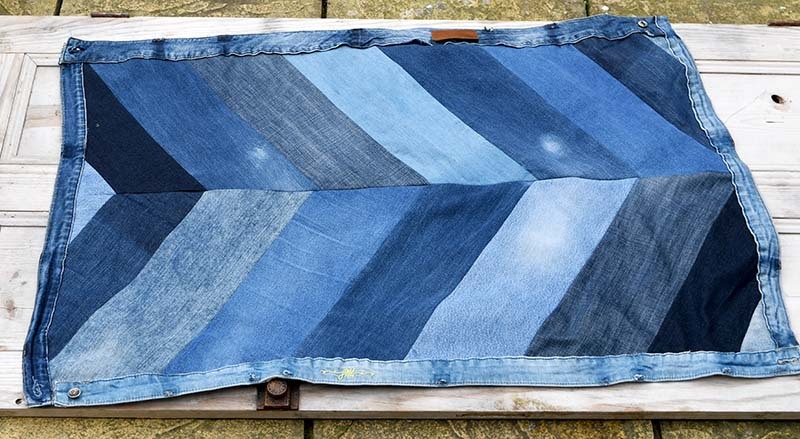 Place the template on the denim draw around it. 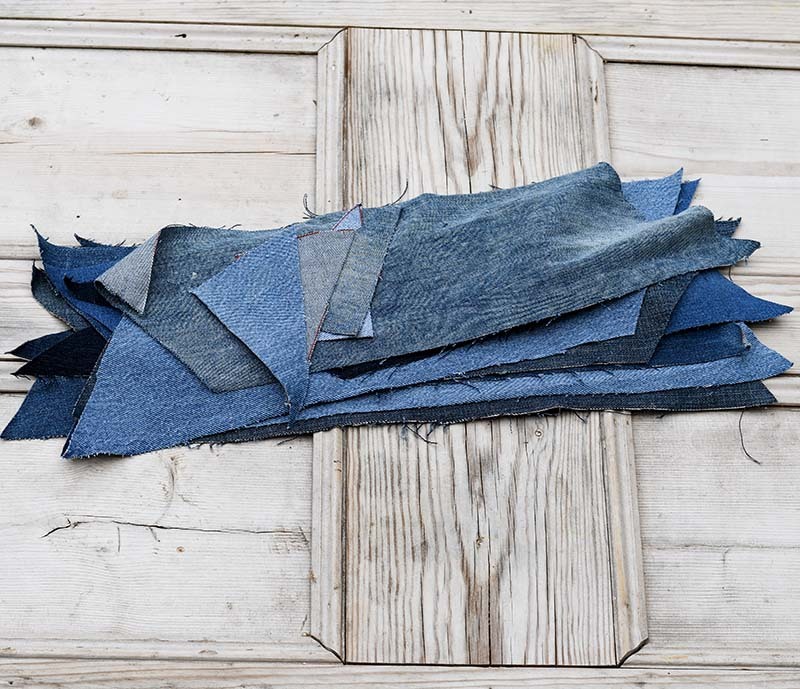 Then using a ruler, rotary cutter and mat cut out the denim pieces. 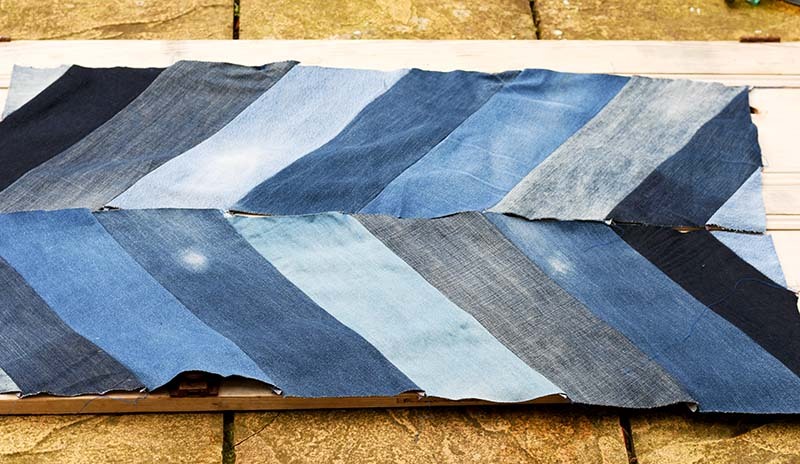 Once cut mark the denim on the wrong side L for left or R for Right depending on which way up you had the template. 3. 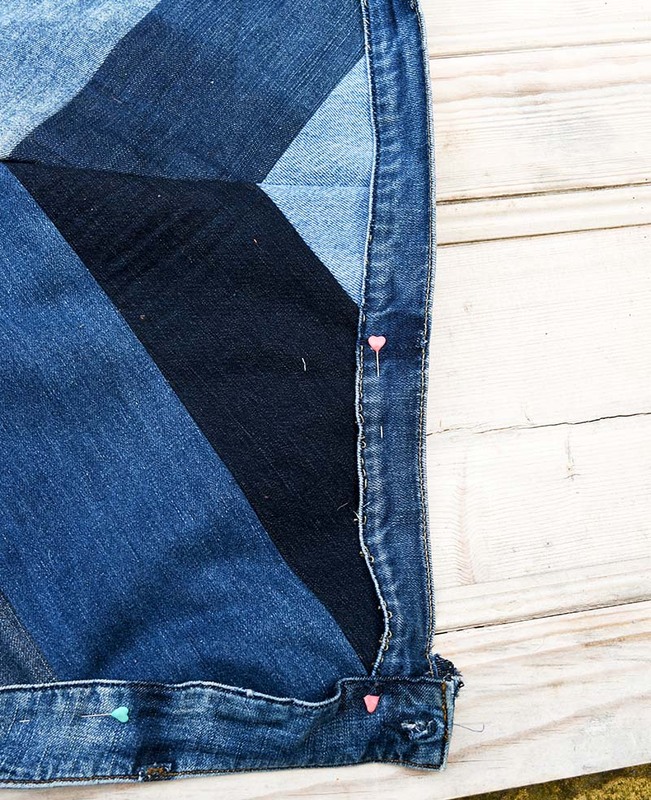 Carry on cutting out the chevron pieces in different shades of denim. This rug was 5 big chevrons in length (10 pieces 5 right and 5 left). Then there were 4 smaller chevron pieces 2 for the top (left and right) and 2 for the bottom (left and right). There were also 4 smaller triangle pieces to finish the rug, 2 at the top and 2 at the bottom. 4. 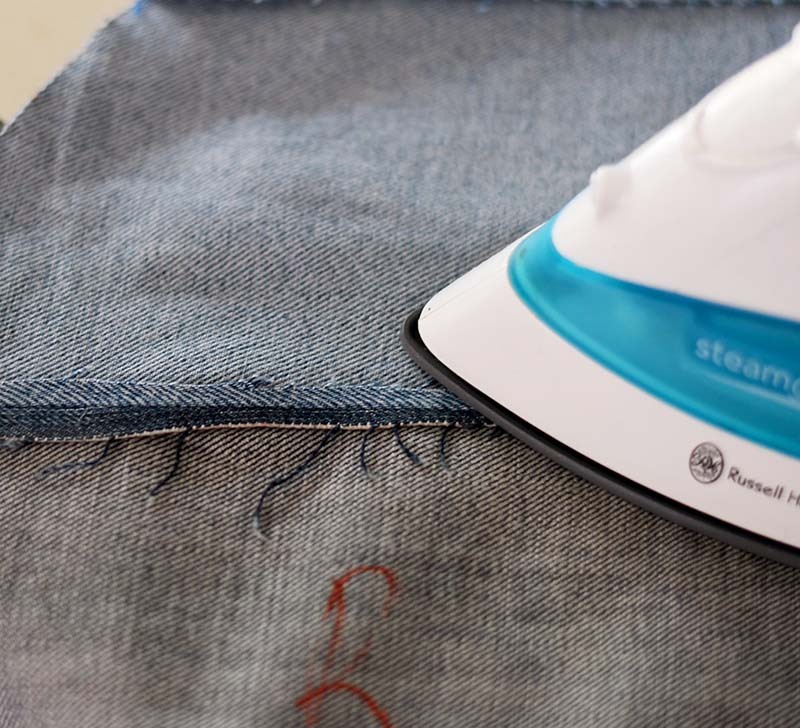 Iron the denim pieces to make sure they are nice and flat. Then lay them on the floor and place them in the rug design you want. 5. Next, pin all the chevrons on the left side of the rug right sides together one by one. Then using the sewing machine stitch them together. Allow about 1cm for the seam and make sure this is a consistent size for all seams. I use the edge of my sewing machine foot as a seam guide. A standard sewing machine should be able to manage this no problem as there are no thick bits of denim such as seams or pockets to deal with. 6. Repeat the pinning and stitching with the right side of the rug. Then to ensure the rug will lie flat. Turn over the sewn sides of the rug and iron the seams open and flat. 7. Once both sides are stitched, lay them side by side an match up the edges. Then pin both right sides together and stitch. 8. The next thing you need to do is to back the rug. I used an old wool blanket. Drop cloth or rug backing can be used instead. I cut the blanket to the same size as a rug. 9. The final thing to do is to attach the backing to the rug and to add a trim. For the edge trim, I used the waistbands of the old jeans. I opened up the edge of the waistbands (like I did here with this recycled sweater throw). I then sandwiched the chevron rug and backing between the waistbands. Unfortunately, my sewing machine struggled with sewing up the thick edging. So I just sewed this by hand which actually only took about 30 minutes for the whole rug. 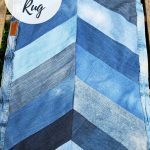 I love denim rugs as they are really hard wearing and this one can just be popped into the washing machine when needed. At the moment it is sitting in the study. Toby, the dog has taken a shine to it. I don’t think it will last long there, one of my sons is already eyeing it up. 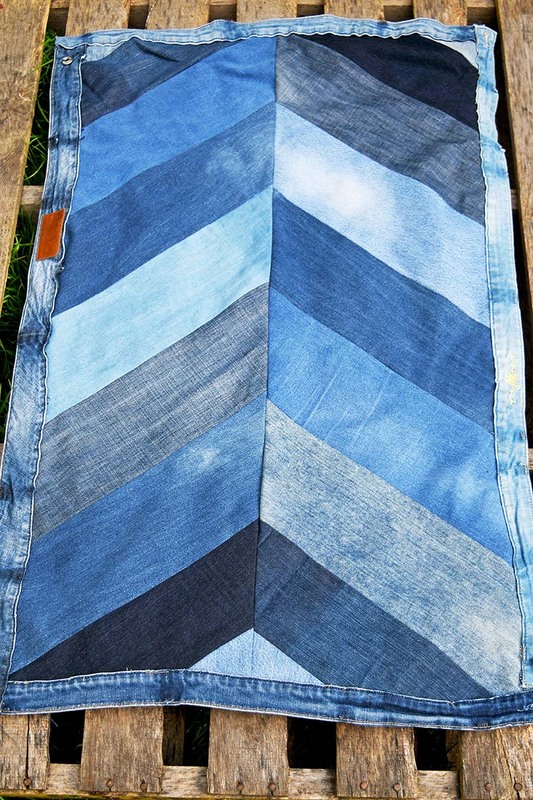 If like me you love to upcycle and repurpose your old jeans, check out some of my other denim crafts and DIYs. For more home decor sewing projects visit Allfreesewing.com. This is lovely Claire, it’ll be one of the features at Handmade Monday this week. I especially like how you used the waistbands, such a nice touch. Thank you, Julie. 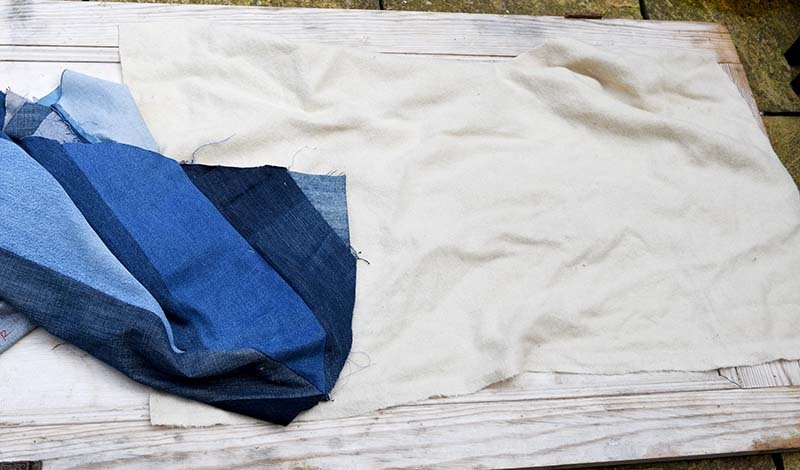 I love to use as much of the parts of a pair jeans as I can. This is so creative, Claire! Thanks for sharing at Vintage Charm! So cute, Claire! Perfect for a teen room or boho home! Thanks for sharing on Homestyle Gathering! 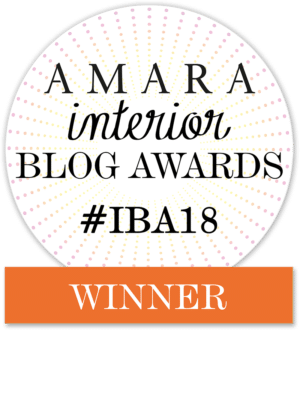 Thank you, I have both teens and a boho home! I love seeing all your denim creations! So creative! Thank you, I just love creating with denim. Very nice! Just dropping in from Funtastic Friday! 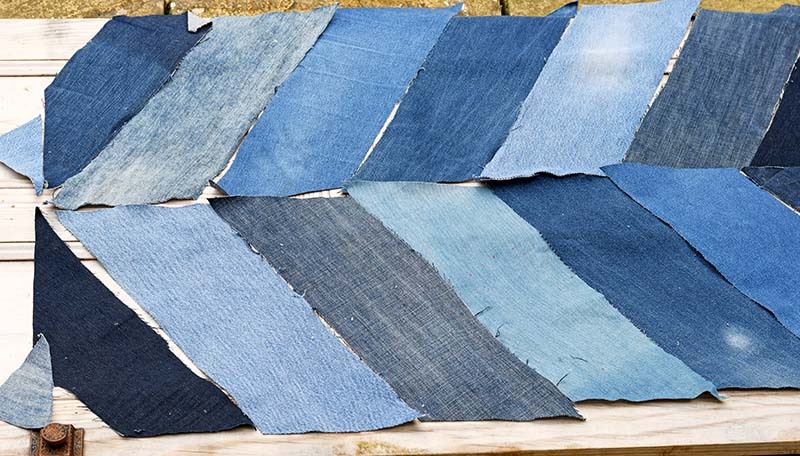 Cool idea, I have lots of denim and need something for on the veranda! Thank you. I bet it would look great on a veranda. Ahhhhhhhh, the Queen of denim makeovers does it again 😀 Love how it turned out Claire, especially since you used all the different denim “colors” to add interest. Thank you, Michelle. I still have a big pile of denim to get through. Thank you, Lisa. 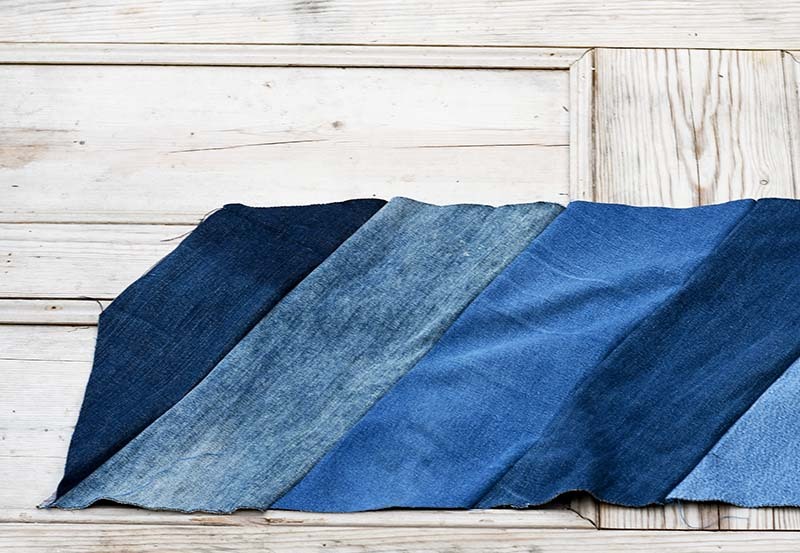 I love to use as many parts of a pair of jeans I can. This is SO cute! What a great idea, and looks fantastic. Thank you so much. The dog likes it he’s been lying on it all day.